As I'm writing this, it's Sunday night, and a week ago I was kind of a mess. Stressed out really doesn't cover how bad it was - every fiber of my being was on high alert. I had spent the day mostly in bed, trying to rest as I was in the clutches of a summer cold, but scraped myself together to meet friends for dinner before an epic workweek began. I was thrilled to be with my friends, though, as they helped to pass those last few weekend hours that I might have spent obsessing over the week ahead otherwise. It was a really unbalanced work week, especially considering how sick I was. Max was sick too, and spent Monday at home, which Marc and I split with me at work in the morning to make a meeting, and Marc at work in the afternoon. I worked as much as I could with a cuddly, coughing boy at my side, and thankfully he was able to go to school on Tuesday. I did my usual work from home Tuesday routine, including a long international conference call, and fitting in a trip to CVS to buy more medicine. Wednesday began very early for Marc, who had a software release at work, and after I took the kids to school I was back in the office. I was still coughing miserably, but I cheered up when the four of us went out for dinner that night. And then it was finally Thursday, the start of a two day meeting, including a dinner we hosted, that was a really big deal at work. This series of meetings was the source of all that stress I'd experienced the weekend before, when I just wanted to get the show on the road already. I knew I was prepared, but I just wanted it all to go so well. Thankfully, looking back now, I can say that it did. 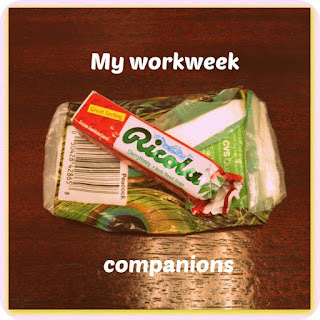 But my companions for the week were my cough drops and my tissues, and not much of Marc and the kids. After the meeting ended on Friday, I left work early and got some much-needed rest before picking up the kids and starting the weekend. I missed my family - on Thursday, I hadn't seen either kid out of their beds the entire day, since I'd left at 6:30 am and returned home at 10:15 pm. Fortunately, that's not my normal situation at all, and I appreciated Marc pitching in extra when I wasn't there. Anyway, I don't usually write much about work, but I wanted to remember this week when I look back. It was an extreme one, but it went as well as I could imagine. Although I kind of can't believe I have to go back to work again in the morning - how is there still more work to be done? Ever have an extreme week of your own?